Many of us tend to take our livers for granted. Our liver is arguably one of the most important organs in our bodies, yet it is probably the organ we neglect the most. Our liver processes and stores important nutrients, regulates our blood chemistry, plays an important role in supporting our immune system, and produces bile to help break down fats. Our liver’s most important function is to remove toxins from our blood . When our liver becomes clogged with too many toxins, like the polluted air we breathe, alcohol, cigarettes, caffeine, sodas, processed foods, and toxic cleaning products, our liver struggles to produce bile and becomes less effective at ridding our blood of these toxins, eventually resulting in liver damage. While many of us are familiar with major signs of liver damage, such as jaundice, diarrhea, nausea, vomiting, pain, and weakness , there are subtle clues that can tell us when our liver might be struggling to work at full capacity, before our liver causes us more serious problems. If we consume foods with excess amounts of cholesterol, or our liver simply produces too much cholesterol, an imbalance can occur in the bile produced and hard little stones begin to form while in the gall bladder; these little stones make it difficult for the gall bladder to empty its bile into your intestines to help with digestion when you eat food. Many people have stones and don’t know it for years until they cause pain and other symptoms that many of you may be familiar with. Gallbladder removal surgery is one of the most common surgeries performed in the U.S. today . Removing your gallbladder can have negative consequences. Since you no longer have a storage pouch (your gallbladder) to contain the bile produced by your liver, the bile slowly empties directly into your intestines, but it may not be enough bile to adequately help break down any fatty foods you consume; this can result in an upset stomach and send you running to the toilet frequently. With so many individuals suffering from liver disease or having their gallbladders removed today, maybe we should show a little more love to our livers and gallbladders. For most people, these issues are entirely preventable via a better diet. Less fast food, less alcohol, and a little less meat & dairy, with a little more fiber from fruits and vegetables might do us some good. What prompted me to do a liver and gallbladder flush? To be honest, I wasn’t looking to flush my liver and gallbladder. I didn’t have any gallbladder issues that I knew of. I was just trying to eat more whole foods and exercise more often. I think most of us feel the way I felt. I generally felt crappy all of the time. I felt like I was always fighting a cold or other virus; I have asthma; I had a lot of intermittent intestinal / stomach pain; and it seemed like absolutely everything I ate gave me hives…sometimes these hives were unbearable. My doctors never really found anything blatantly wrong with me. A close friend of mine was desperate to improve her health so she asked me to try this crazy flush with her. As her really supportive friend, I said 'yes'. I didn’t realize how intense and uncomfortably intimate this experience would be when I had agreed to it. I did not expect to see any changes to my health, but thought the adventure would be fun anyway. Please note that this author indicates that following his explicit instructions is very important – the author gives different options for prepping throughout the flush – but he asks that we do not deviate from his suggestions. I would not attempt this flush without following his exact book instructions. In order to soften any gall stones in my gallbladder, I am required to drink 32 ounces of apple juice every day (throughout the day). The malic acid in apple juice softens the stones to help them pass through the bile ducts without issue. I was able to eat regular foods throughout the 5 days, but the author asks that I avoid cold or chilled foods & beverages, and foods from animal sources…including dairy and fried foods. I behaved pretty well for most of the 5 days. I primarily ate steamed vegetables and some rice for that week, but I cheated a little here and there with some fast food. The first 5 days were easy...until I came to the sixth day. The author asks us to cleanse our bowels either a few days before the flush or, ideally, on the sixth day, to ensure there are no obstructions. The author gives different options for bowel cleansing, but I ended up being talked into my first colon cleanse ever...with my friend! Now, that’s a good friend, right? I’ll just say that it’s a bit embarrassing and very surprising what you find, but not at all painful. I’ll skip the details on this and move right along. On Day Six, I am asked to drink the usual 32 ounces of apple juice, but my diet must now be a bit stricter: no spices, milk products, butter, oils, ham, eggs, nuts, pastries, or cold cereals. The author suggests oatmeal for breakfast then, for lunch, steamed vegetables with white rice with very little salt, if needed. I’ll admit that I was becoming increasingly afraid of what was to come, so I followed these last meals to the letter! By 1:30 p.m., I am instructed not to eat or drink anything except water (I cheated a little and stopped at 2 p.m.). At 6 p.m., I drink the first jar of the Epsom-salt water…ugh! A squeeze of lemon and a straw (as suggested by the author) make this go down with a little more ease! By 8 p.m., nothing is really happening, surprisingly. I proceed to drink the second jar as instructed…now things are happening. I cannot leave my house or be far from a bathroom, for that matter. At 10 p.m., I am instructed to drink my homemade concoction of ¾ cup of freshly squeezed pink grapefruit juice mixed with ½ cup of olive oil (prepared earlier). This sounds even more disgusting than the salt water I had earlier! I grab a large straw, position it as far back down my throat as I can (to minimize taste) and begin to drink it down as quickly as possible so I won’t throw up…wait…it actually tastes pretty good! This isn’t so bad after all! I immediately lie down on my back after drinking the concoction, as instructed. I hear some rumbling and feel some weird sensations in my abdominal area, but there’s no discomfort. I quickly fall asleep. At 2 a.m. that morning, I immediately jump out of bed due to extreme nausea, but I’m throwing up so violently before I’m all the way out of bed that I can’t control where it lands. I run to the bathroom while still vomiting and I empty the other end. Repeatedly. The vomiting subsides quickly, but the bowel emptying continues on and off about every hour until about 8 a.m. My husband was so incredibly horrified that I would intentionally do something like this to myself, after watching the mayhem. There were stones – green and brown. Actual real stones like the ones we see online! There were tons of them and they kept coming! At 6 a.m., if I’m not too sleepy, I may do some light exercises like yoga. WHAT?! Are you kidding? I’m lying back down! By 8 a.m., even though this goes against every cell in my body, with shudders of disgust, I drink the last jar of salt-water solution to keep those bile ducts open. At 10 a.m., I drink a little freshly squeezed pink grapefruit juice, followed by very light servings of other fruit and a little oatmeal. Despite my super rough night, I don’t remember ever feeling this good! Throughout the rest of that day, stones continued to empty out. Even though I violently emptied everything in my body that prior night, I never felt any pain at any time. As crazy as this sounds, I felt like I really cleaned my liver and gallbladder and that I must have been really toxic for such a violent response. I was so shocked by all of the stones I had seen that I decided to do this cleanse several more times over a period of the next two years. The following cleanses were not violent like the first time. I never threw up or even had nausea during each of the subsequent cleanses. I repeated cleanses until there were hardly any stones left. Each cleanse brought more improvements to health. My skin improved dramatically. I rarely have break outs or hives anymore. The sharp intermittent pain in my intestinal area disappeared. My asthma was a little better – breathing was easier. I stopped getting sick so often. I lost some belly fat. This flush is not for the faint of heart, but I feel that it has really made a difference in my life and is worth doing it periodically. My skin improvement was the fastest and most obvious change to myself and everyone else around me. This biggest drawback for me is that I can’t leave my home on Day Six from about 6 p.m. until late the following morning, which can be terribly inconvenient when you lead a busy life. The most difficult part of the flush for me is maintaining a better diet during and after the flush. 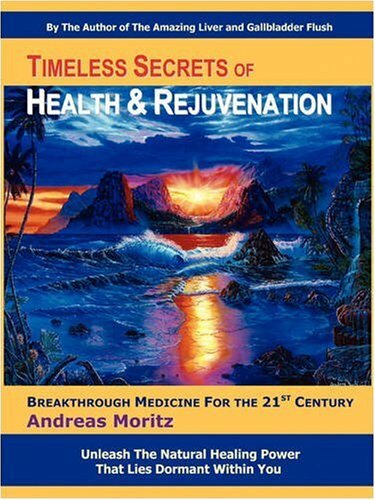 Andreas Moritz expects us to lead healthier lives and to put better things in our bodies…so much easier said than done. Change is slow for me, but I’m always striving to eat a little better each day. I definitely recommend this flush; I feel the benefits far out-weight the temporary discomfort. Now get out there and take better care of your livers and gallbladders! I also have gallstone and was advised by my doctor to have it removed through surgical method. But I was afraid so I tried looking for ways to flush my gallstones naturally. I came across this method, but I am still afraid for the last part. So what I do is I just eat an apple and drink apple juice everyday. Other procedures has apple cider vinegar with them which one should take along with lemon juice. I just wish that by continued drinking of apple juice, my gallstones will dissolve and be flushed out of my body soon. I'm definitely no expert, but I think you have to drink the olive oil with citrus in order to flush the stones out. The olive oil is giant dose of fat that causes your body to release a whole bunch of bile at once...this action floods out the stones in your gall bladder. There was absolutely no pain for me at all when I did it, just lots of toilet time, lol! The apple juice is definitely softening the stones so they wouldn't get stuck. Don't be afraid. If you do it, let me know how your experience went! Dr. Melissa Palmer Hepatitis & Liver Disease. New York: Avery, 2004. 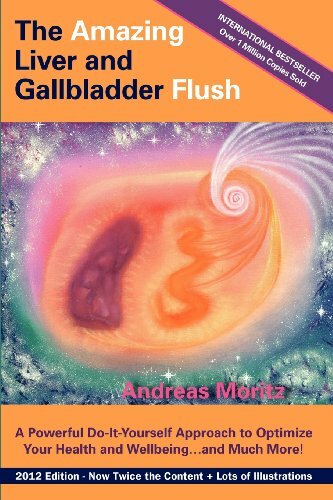 Andreas Moritz The Amazing Liver and Gallbladder Flush - Updated Revised edition. Ener-chi.com: Ener-chi.com, 2012.